For un-parallel comfort and performance during the winter months, the Mystic Dutchess wetsuit offers all the quality tech found in Mystics high end range at a lower price. Featuring 100% M-Flex neoprene the Dutchess is super soft and most importantly super stretchy and flexible offering the perfect fit for any winter adventurer. 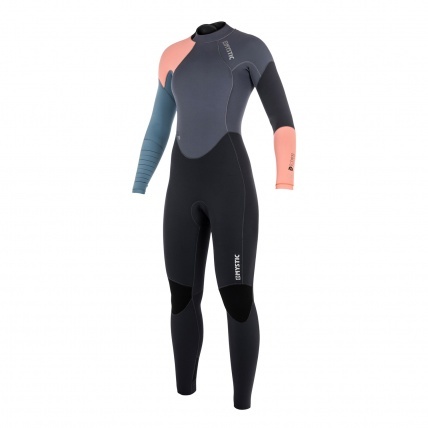 With critical stretch taping, overhead backup and glued blind stitching this wetsuit is designed to prevent cold water from seeping in through the seams and the warm water from seeping out! Mystic's glide skin double neck construction prevents rubbing and irritation on the neck while aquaflush prevents any over accumulation of water within the wetsuit by using perforated neoprene on the calves to vent excess water. To finish it all off we have polar lining on the chest and back panels to reflect heat back into the wetsuit keeping you toasty warm all day long!